Plant growth and productivity are greatly impacted by environmental stresses. Therefore, plants have evolved mechanisms which allow them to adapt to abiotic stresses through alterations in gene expression and metabolism. 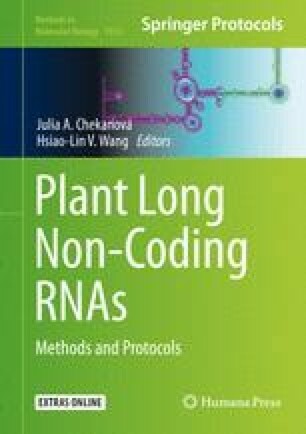 In recent years, studies have investigated the role of long noncoding RNA (lncRNA) in regulating gene expression in plants and characterized their involvement in various biological functions through their regulation of DNA methylation, DNA structural modifications, histone modifications, and RNA–RNA interactions. Genome-wide transcriptome analyses have identified various types of noncoding RNAs (ncRNAs) that respond to abiotic stress. These ncRNAs are in addition to the well-known housekeeping ncRNAs, such as rRNAs, tRNAs, snoRNAs, and snRNAs. In this review, recent research pertaining to the role of lncRNAs in the response of plants to abiotic stress is summarized and discussed. This work was supported by grants from RIKEN, Grants-in-Aid for Scientific Research provided from the Ministry of Education, Culture, Sports, Science, and Technology, (Innovative Areas 18H04791 and 18H04705), the Japan Science and Technology Agency (JST), and the Core Research for Evolutionary Science and Technology (CREST) JPMJCR13B4 to M.S.